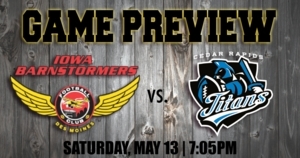 Des Moines, IA – The Iowa Barnstormers (8-2) look for its seventh consecutive win as they take on in-state rival the Cedar Rapids Titans (1-10) on Saturday, May 13, 2017. Kickoff is set for 7:05 p.m. CST at the Wells Fargo Arena. Last week, the Barnstormers defeated the Green Bay Blizzard 41-34 at the Resch Center in Green Bay, Wisconsin. Iowa used its rushing attack to beat the Blizzard when quarterback Travis Partridge scored five rushing touchdowns. The biggest touchdown arrived when Partridge ran in a seven yard score to put the Barnstormers ahead 41-34 with under five seconds to play in the game. Defensively, cornerback Dee Maggitt, Jr. recorded an interception and returned a fumble for a touchdown. Defensive back Bryce Enyard also recorded an interception and tallied five tackles. Last week, the Titans lost a home game to the Arizona Rattlers 34-32. Former Barnstormers quarterback Brion Carnes threw four touchdowns and passed for 209 yards. Receiver Damond Powell hauled in two of those scores and had a game-high 64 receiving yards. On the defensive side, cornerback Antonie Johnson took an interception back for a touchdown and linebacker Robert Haynes had a game-high 12 tackles with one of those being a sack. The Barnstormers will also be hosting their Annual Motorcycle Ride and Tailgate. The tailgate will begin at 4:00 p.m. and feature live music, drink specials, and food truck options from SPF Yellow Wagon, Roadside Tacos, and Outside Scoops. Fans with a ticket to the game will have entry to the tailgate party. The Barnstormers will also be hosting a t-shirt giveaway, the first 1,000 fans through the doors at Wells Fargo Arena will receive a free t-shirt courtesy of Great Southern Bank. Single game tickets are on sale now for the Iowa Barnstormers 2017 season starting as low as $12 per seat. Don't miss a minute of the action this season! For more information, call the Barnstormers at (515) 633-2255 or log onto www.theiowabarnstormers.com.